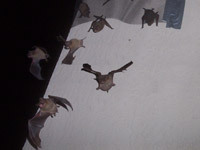 Here's a huge group of bats living inside an attic - they cling to the walls. 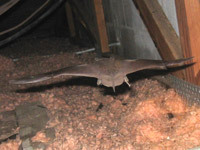 This is a bat flying in an attic - they usually crawl in the attic instead of flying. Here's a couple of bats flying out of an attic at dusk. 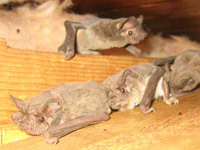 These bats are crawling along the attic beams, ready to fly out for the night. How then, does one get them out? You can't go into the attic and just grab them and get them out that way. They're all stuck in little crevices, and will flee as soon as you approach, and even if you did manage to get one, then what? You also can't trap them. See this page for more information about the ineffectiveness of bat trapping. In short, bat trapping is harmful to these beneficial creatures, very difficult to attempt, and pointless to actually solving the problem. Read the following page to learn why there are no effective bat repellents. Also, some people try to use high-pitch ultrasonic sound making machines, but read this page to learn why the FTC has declared them fraudulent and why high pitch sound machines don't work. There is certainly no such thing as an effective or legal bat poison. It's usually illegal to kill bats, and it'd be a disaster to try it. You wouldn't kill them all, and the ones that died would rot and create an odor problem and biohazard in your building. 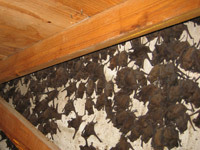 Luckily, it is possible to 100% completely and 100% effectively and legally remove a colony of bats living in an attic. The proper way to do it is via bat exclusion. You can't kill the bats, you can't relocate the bats (they'll migrate back no matter how far you take them), but you can get them all out and permanently seal them out. The basic principle is that they're excluded from the attic via one-way exit devices. Each job is different, each architecture is different, each colony is different, and time of year and other conditions can make the type of approach vary quite a bit. It's highly specialized work, and only a licensed professional with specific bat control training and years of experience should attempt bat control. To the right you'll see a photo of a bat exclusion - the bats are flying safely away. None are harmed, all are removed. Learn more: Can bats walk on the ground? When the bats are fully removed, it's vital that the building is 100% sealed against re-entry. Bats are creatures of habit, and after they're blocked out, they'll work very hard to get back in. They can enter extremely small gaps. If you leave just one area of a half-inch open, they'll find it and get back in - believe me, I know. It's absolutely amazing how small a hole they can squeeze through. Furthermore, it's often very important to clean up after the bats. 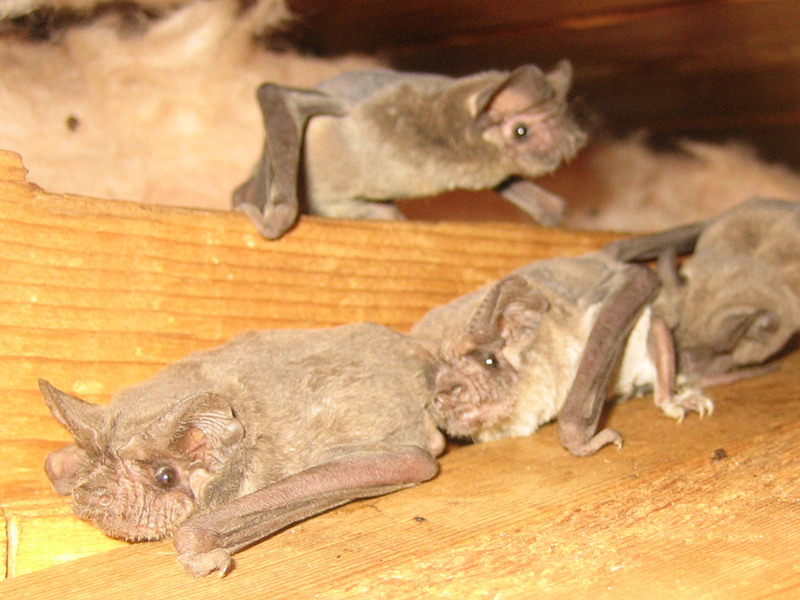 If you've had bats living in your attic, they'll leave behind their droppings and urine. This is a problem not only because it creates an odor problem, but because the droppings can grow fungus that can cause the lung disease histoplasmosis in humans. It's often a good idea to have your attic cleaned if it's been inhabited by a colony of bats. More information about bats: Do bats hibernate? Exclude them via one-way exit devices - let them fly out. Seal up all of their entry points, down to 3/8 inch. Do not attempt to trap or relocate them - it won't work. Repellents, devices, gimmicks, won't do the trick. 24/7 Wildlife is a professional wildlife removal company located in Orlando, FL. We are the leading experts in central Florida at solving conflicts between people and wild animals like bats, and situations like bats in the atic, or attac (some people misspell). We are fully licensed and insured, and dedicated to the highest quality of work. We guarantee all of our services, and not only do we remove the problem wildlife and bats from your home or business, but we make sure to repair any damage that they cause, clean up the biohazardous waste that they leave behind, and seal all entry points so that no animals can ever enter your house again. Click here for an example of how to get rid of bats. Give us a call any time for more info. If you live just north of NYC, call Westchester County Wildlife Control. 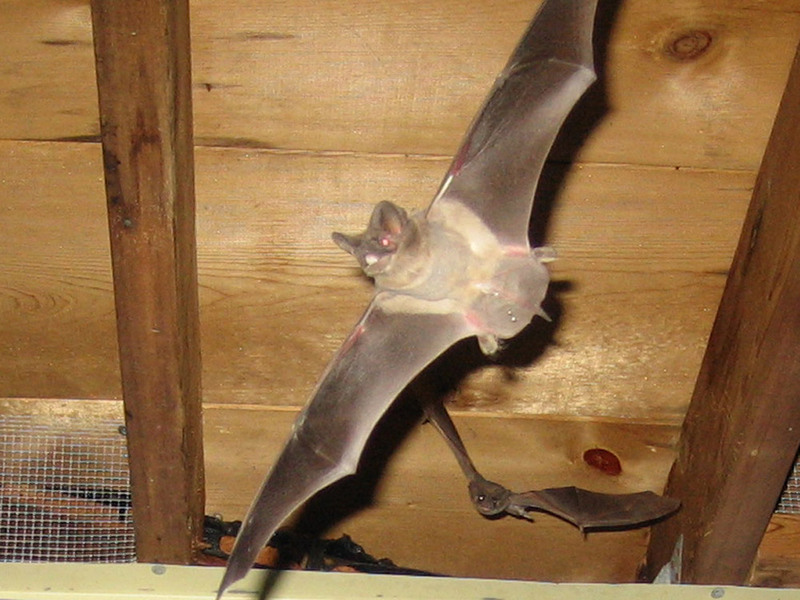 How to get rid of bats in the attic: There are a lot of animals that you can do some things with to try to get them out of your home. Animals such as squirrels, raccoons, birds, and rats can be a nuisance, and can even pose a health risk to you, but you can do a lot to be able to get rid of them quickly and easily. This is not as true if you were trying to get rid of bats. Bats are very dangerous animals, not only because of the diseases and pestilence that they carry within their bodies, but also because these are very aggressive predators. While the squirrel, raccoon, or rat would try to run away from you if you came upon it, a bat most likely directly attack you. This would obviously be quite dangerous to you. One of the most sensible options to choose is to hire a professional to do the job for you. While this may cost you a little bit of money, these are not animals you want to be fooling around with. If you have a bat in your home this creature simply needs to be out. Hiring a professional may be the only sensible thing to do. There is another reason why it makes sense to hire a professional. Many states have laws that dictate what kind of means can be used to treat a bat infestation within your home. This includes the use of poisons or other chemicals as well as what kind of devices can be used to get rid of these animals. You don’t want the bats in your home, but you also don’t want to be in any kind of legal trouble either. This is another reason why hiring a professional may make the most amount of sense to you. The next thing to consider is the use of a scare tactic to try to get rid of them. If you’ve decided that a professional something simply can’t do than scaring the animals away becomes your best option. To accomplish this you will need to do is to place some very large lights and speakers in the attic of your home. Do these during the daytime when it is light out and make sure that you are very quiet do it. As it begins to turn to dusk crank on the lights in the music so that they startled the bats. Bats prefer to be in the dark so when they see the lights on they will scurry away to the entryway they are using to get into your house so that they can get outside. Once outside need to go out and close up the area that they are using to get in so they cannot reenter your home.